Are you a regular Lazada customer? Well, this app is for you. Lazada as one of the best online store in the Philippines launches it own mobile app Download in PlayStore now! Compatible on every Android device, by installing Lazada Application on your mobile phone grants a Php750 OFF for purchased Php2,000 and above. And guess what by by downloading Lazada App, you'll get a chance to win an Haipad A13 7” tablet. With its exciting and cool features, plus additional security when purchasing online. 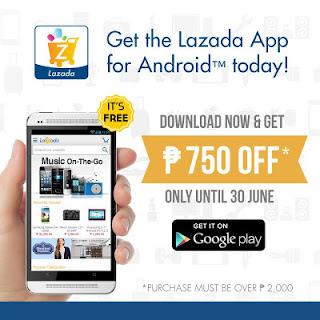 Lazada App also gives convenience in browsing wide product lines, this promo is only valid until June 30, 2013, and vouchers can be use to any product/gadgets as long as it complies the promo terms and condition, so what are you waitng for download the App now and get and get Php750 discount. By downloading the app you will get a P750 voucher. Voucher is only limited to one time purchase, you may not get 2 or more vouchers for the same user. Lazada promo voucher can only be applied to minimum of P2,000 purchase. You can only win once, and will be notified via email. I hope I helped, have a nice day!